I was having another one of those no-win situations with my eight-year-old son, where neither of us wanted to back down. Finally, I lost it. I told him that unless he could stop with his tirades, he would not be going with me to run errands. For the rest of the afternoon, he simmered like a pressure cooker. When it came time to run the errands, he reluctantly went to his bedroom. “Of course not, he is being punished for his behavior,” I bellowed. I recalled Ephesians 2:4-5, “But because of his great love for us, God, who is rich in mercy, made us alive with Christ even when we were dead in transgressions–it is by grace you have been saved” (NIV). At the toy store, I picked out an electrical kit I knew my son would enjoy. His behavior didn’t “deserve” it, but just the fact that he is my son and I love him dearly was reason enough for the extra gift. When I returned home, I apologized to my son for my own stubborn, perfectionist behaviors. I explained that sometimes I put too much emphasis on his “good” behavior instead of the “goodness” within his heart. I expressed how grateful I am for God’s mercy and His grace. God so graciously gave His only Son to me, chief of all sinners, so that I could be saved from my sin and have an intimate relationship with Him. How could I not administer that same type of grace with my own son? Amazing grace. Just what this imperfect mother needs to share with her imperfect son. Stacy Rothenberger, from Lansdale, Pennsylvania, is learning never to say never. Moving to the East Coast, marrying a dairy farmer, having five children, homeschooling, and sharing all of her difficult life lessons are just a few of the “nevers” God has given her to write about. Through the daily struggles and victories in her Christian walk, God is teaching her the importance of never saying never. It was Christmastime and our sixteen-year-old daughter, Felicia, was an angel in a live nativity. Everyone was in place. Joseph stood near Mary as she gazed into the manger. Shepherds, wise men, and animals brought authenticity to the manger scene. The fresh smell of hay and the bleating of lambs filled the night air. Just then Justin, the four-year-old boy Felicia regularly babysat, arrived to see the event. He was so excited that his mother could barely keep up with his questions. He wanted to know if baby Jesus had a bottle and why the donkey had a fuzzy cross on her back. Justin’s excitement was understandable. His parents had taught him about baby Jesus at home and Miss Sarah had been telling his Sunday school class stories about Christmas and the Christ child’s birth. That night at the living nativity, he eagerly watched those stories come to life. Justin was well prepared to see this special baby lying in the manger. However, he was not ready for the rest of the scene. The three angels dressed in long white robes and golden halos stood on an elevated platform just behind Mary and Joseph. When they blew their shiny gold trumpets, Justin looked up. He stared. Then his lower lip quivered. “For tonight I am an angel,” she said, smiling down at the small boy. A smile of relief spread across Justin’s face. “I’m glad you aren’t a real angel.” He gave her a hug before she took her place back on the platform. Children look at life from a more literal perspective than adult do. For them, black is black and white is white. They latch onto words and ideas with innocent trust. In Justin’s four-year-old mind, angels came only from heaven and in order to get to heaven, a person had to die. This encounter between our daughter and her small friend made me think of my own faith. Jesus said, “I tell you the truth, anyone who will not receive the kingdom of God like a little child will never enter it” (Luke 18:17, NIV). How great it would be if more adults believed the Christmas story as simply as children do. That would give the real angels reason to rejoice. Maxine Marsolini is the author of Blended Families and the Blended Families Workbook. Both books are designed to equip the stepfamily for harmonious living. Her articles have appeared in magazines such as Decision and Bible Advocate. Maxine lives in the beautiful Pacific Northwest. She is a pastor’s wife and member of the American Association of Christian Counselors. You can find out more about Maxine at blendedfamilies.net. Psalm 136 takes the form of a litany. After each call to worship and each recounting of God’s awe-inspiring deeds, the text reads, “His love endures forever.” Spend some time contemplating the wonderful things God has done for you and your loved ones. List them, and then write your own refrain, such as “God shows His love to the Millers.” If you live in a country that celebrates Thanksgiving, then pray your litany aloud together as part of the celebration. Worship with all you heart, giving voice to your gratitude and love. “Give thanks to the LORD, for he is good; his love endures forever” (Psalms 118:1, NIV). When my grandson Peter turned two years old, I wanted to do something special for his birthday. I decided to write short sentences about him with a repeated refrain everyone could chant. Although Peter had his back toward us and played with his new toys, he turned when he heard the second chorus of, “We love you, Peter, and we’re glad you were born!” His grin widened as he listened. Soon he danced with glee as he heard the affirming words over and over. When we finished the last, “We love you, Peter, and we’re glad you were born!” he beamed and said, “Again.” Even a two-year-old can’t get too much love and affirmation. God know that we, too, need affirmations of His love. Psalm 118 assures us “his love endures forever” (verses 1-4, 29). God’s love is deep, and He demonstrates it beyond words. He answers us and has become our salvation (v. 21). He has done marvelous things (v. 23), saves us, grants us success (v. 25), and has made his light shine upon us (v.27). Just as Peter didn’t tire of hearing how much we loved him, we can never experience too much of God’s love. Today, let’s bask in the wonder of His lavish love. Lydia E. Harris writes devotionals, book reviews, articles, and a tea column that appears across the U.S. and Canada. She has contributed to numerous books including, The Power of Prayer and For Better, for Worse: Devotional Thoughts for Married Couples. You can find out more about Lydia at http://mentoringmoments.org/lydia-harris/. In The Red Suit Diaries author Ed Butchart recounts in humorous, touching, and heart-wrenching stories his more than twenty years of experience as a professional Santa. His goal has been to use the secular Santa Claus myth to minister the love of Jesus to every child who crosses his lap–especially those that others would prefer to turn away. In The Twenty-Third Psalm for Caregivers, a beautiful little gift book that is not just for caregivers, author Carmen Leal portrays a whole new dimension of childlike faith. Through the struggles and triumphs of both caregivers and care receivers, readers will find their own faith strengthened and their compassion renewed. The story of a little boy named Christian alone is worth the price of the book. Christina DeLoach, a young contemporary Christian singer, has three CDs you may enjoy. Gentleness and childlike faith permeate her performance of songs such as “Twinkle Twinkle” on her Christmas album, “Hide Me in the Shelter” on the CD titled He Calls My Name, and the title cut on her CD, I Will Be Your Voice. Many of Christina’s passionate performances are accompanied by interesting guitar, keyboard, or piano stylings. Christina’s music not only entertains, but also inspires listeners to worship Jesus Christ. You may purchase her CDs and arrange for concerts in your city by visiting christinadeloach.com. The months of October through December are a season of change often associated with aging or dying. Yet many of the most exciting and love-filled holidays occur during this time. Perhaps during the shortened days of autumn we need reminders that joy, love, and laughter do not end with the flowers of spring, the sunshine of summer, or even with the death of a loved one, as two of our editors recently experienced. 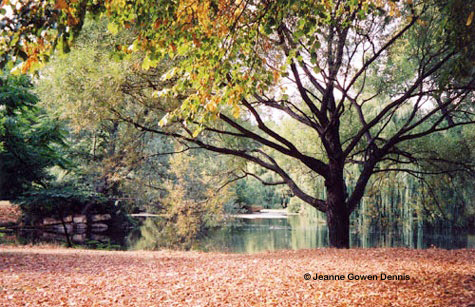 The cover photo taken by Jeanne Gowen Dennis in England is a reminder of God’s love for us in sending His Son, Jesus, to earth to die for our sins. In the autumn, seeds fall to the ground and are buried until the winter is past. Then in spring they burst forth with new life and potential. Because Jesus became the “kernel of wheat” that died to give us forgiveness and eternal life (John 12:24), we can have confidence that spring will come again and new life will blossom. With Him as our Lord and Savior, we have hope that we will live forever with God and see our loved ones again in heaven. Let us celebrate the season of autumn in remembrance of the fact that, no matter how difficult our circumstances, God’s love for us never dies. Though love, hope, and joy may seem hidden away for a time, they will return and burst forth like the flowers of spring. May God bless you and your families as you celebrate His bountiful blessings and love.